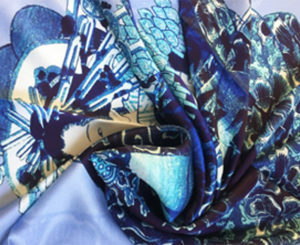 This Scarf has a design inspired by the work of Artist Utagawa Kunisada. He was one of the three best representatives of the Japanese color woodcut in Edo period. It makes a unique gift and wrap you in warmth and beauty. Katsushika Hokusai (1760-1849) was the leading ukiyo-e artist and printmaker of the later Edo period. 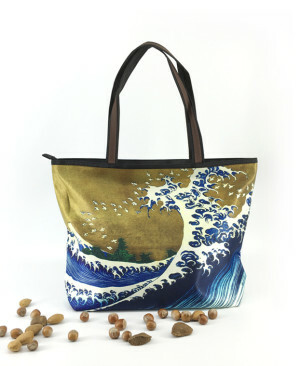 This unique Shopper bag has a design inspired by Hokusai’s iconic woodblock print. It is a colored version of the famous Great Wave off Kanagawa from the 36 views of the Fuji and the wave crests are the shape of birds. It makes an elegant gift and is both stylish and ideal for all your shopping. Katsushika Hokusai (1760-1849) was the leading ukiyo-e artist and printmaker of the later Edo period. 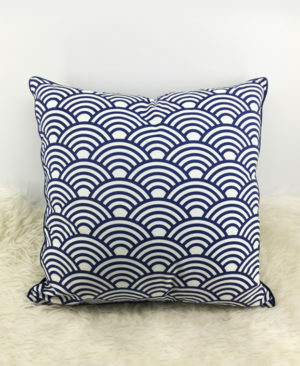 This unique cushion has a design inspired by Hokusai’s iconic woodblock print. It is a colored version of the famous Great Wave off Kanagawa from the 36 views of the Fuji and the wave crests are the shape of birds. This artistic cushion covers is made of 100% satin vegan silk. It has a design inspired by the work of Artist Zhi Yu featuring a bird resting on a magnolia flower branch. Artist Zhi Yu was a Court Painter and also worked for the Qianlong Emperor as a government servant. His drawing is in an academic style and is inspired by nature including flowers and birds, fishes and insects, which are painted vividly using fine lines and graceful movements. 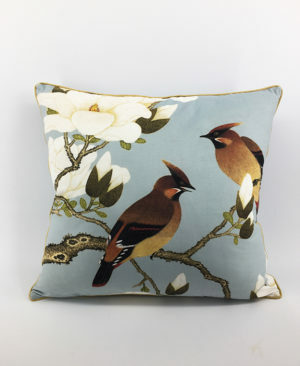 This cushion makes an elegant gift and a very tasteful addition to any room decor. This artistic cushion cover is made of luxurious velvet. It has a design inspired by the work of Artist Zhi Yu featuring a bird resting on a magnolia flower branch. Artist Zhi Yu was a Court Painter and also worked for the Qianlong Emperor as a government servant. His drawing is in an academic style and is inspired by nature including flowers and birds, fishes and insects, which are painted vividly using fine lines and graceful movements. 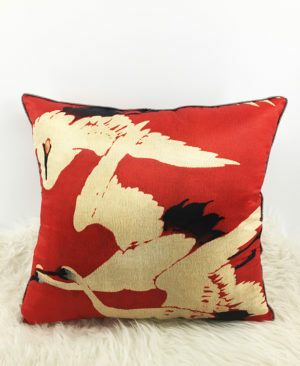 This cushion makes an elegant gift and a very tasteful addition to any room decor. Achieve your effortless style with our arty canvas totes, live greener and avoid plastic bags from your daily shopping. This canvas tote features the work of Chen Hongshou, a painter during the late Ming Dynasty. The artists is skilled in human figures, but he was also gifted at other subjects, including birds-and-flowers, grasses-and-insects, and landscapes. The artist has a distinct style in painting subjects of nature as you can see the image of this bird do not represent an absolute likeness. It makes a unique gift and ideal for carrying your everyday essentials. 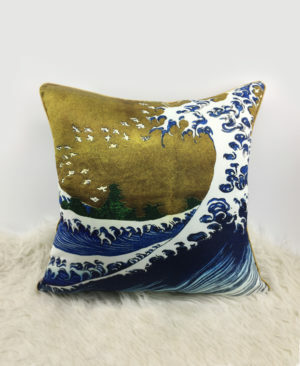 This artistic cushion cover is made of luxurious velvet. The design features amazing artworks inspired by Edo period kimono wave patterns. The image is striking with exquisite blue colouring and wave patterns. Weather you’d like to add some fluidity to your daybed or an artistic atmosphere to your lounge area, these cushion covers are your perfect choice to do so. A great gift for art and culture lovers alike. 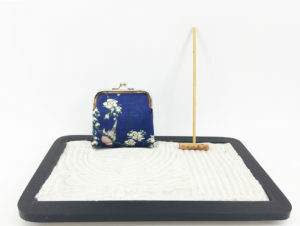 This purse has a design inspired by the work of Artist Katsushika Hokusai (1760-1849), the leading ukiyo-e artist and printmaker of the later Edo period. It features a tiny bullfinch perching upside down on a branch amidst an array of delicate white cherry blossoms. It makes a unique gift and perfect to slip into your handbag. This artistic cushion cover is made of luxurious velvet. 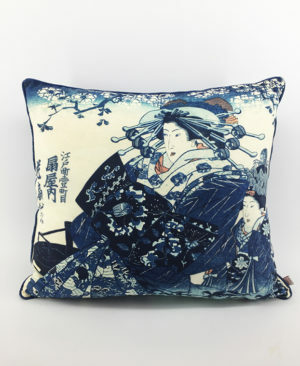 It has a design inspired by the work of Artist Utagawa Kunisada, from the series of Courtesans Printed in Blue. He was one of the three most recognised Japanese color woodcut in the Edo period. Weather you’d like to add some fluidity to your daybed or an artistic atmosphere to your lounge area, these cushion covers are your perfect choice to do so. 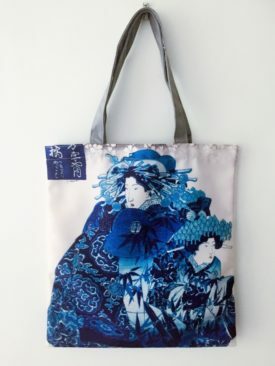 This canvas tote has a design inspired by the work of Artist Utagawa Kunisada, from the series of Courtesans Printed in Blue. He was one of the three most recognised Japanese color woodcut in the Edo period. 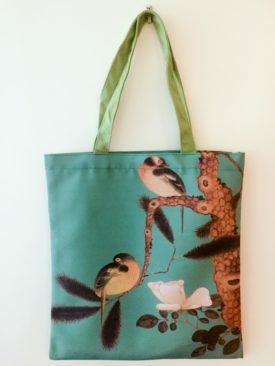 Lightweight and convenient, this canvas tote will surely come in handy for shopping and you’d have a chance to show off your great taste and passion in art. 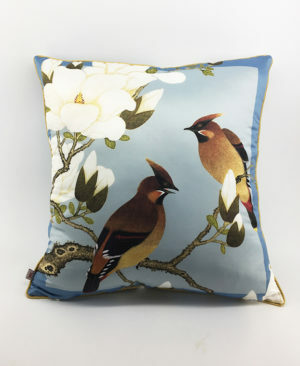 This artistic cushion cover is made of 100% satin vegan silk. The design features amazing artworks inspired by Edo period kimono patterns. 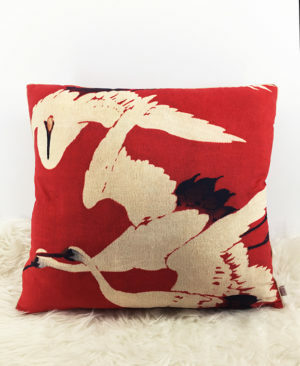 The image is striking with exquisite red colouring and elegant crane pattern. Weather you’d like to add some fluidity to your daybed or an artistic atmosphere to your lounge area, these cushion covers are your perfect choice to do so. This artistic cushion cover is made of luxurious velvet. The design features amazing artworks inspired by Edo period kimono patterns. The image is striking with exquisite red colouring and elegant crane. Weather you’d like to add some fluidity to your daybed or an artistic atmosphere to your lounge area, these cushion covers are your perfect choice to do so.